Holidays, the Best Time to Discuss Important Family Estate Plans? Coming to the realization that one or both of your parents may need assistance because they are getting older is, itself, not an easy process. Your parents may be unwilling to discuss their needs with you out of denial or shame. But sometimes the lack of communication about parental needs is borne out of simple lack of making their needs and care a priority and making time for communications about it. Holidays can provide the ideal opportunity to begin this discussion if you've not yet started, or build on any agreements you've made with them and/or provisions you have put in place to ensure their health, safety and happiness. Not the holidays; do you really mean that? Yes, the holidays, really. Really the holidays are--or can be--an optimal time to have the discussion about if, and if so, what type of help your parents need. Many people are less pressured by work duties during the holidays, family members are often together when they cannot be together other times of the year, and most importantly, you and your siblings and/or significant others are with your parents and can observe them first-hand. What other time are all of those benefits present? Rarely, if ever. Estate planning is about life's transitions as well, not only one's demise. Who will serve as the financial backup person (fiduciary) to the parents? Will it be one of the children, or a trusted third party. Where are all the important papers of life - birth certificates, DNR, AMD, power of attorney, etc? Friedman LLP's Kimberly Dula advised in The Street piece, "Estate Planning Over Thanksgiving? Time to Talk Turkey" to treat the discussion as a family meeting. Dula referencing how she had facilitated "...successful holiday estate planning meetings in the past, families need to make sure that they treat it like a family meeting, ban cell phones from the room, get someone to watch the kids, make sure any stragglers are included through a conference call or videoconferencing and, of course, that everyone is in on the plan." Your parent's capabilities may be better than you imagined, but more often they are worse. What sounded like a crisis when expressed by your mother over the phone ("I can't do X, Y or Z") may be easily solved, or may have been an exaggeration about frustration with some other new limitation in her abilities that is affecting her ability to cope with tasks she once accomplished with ease. 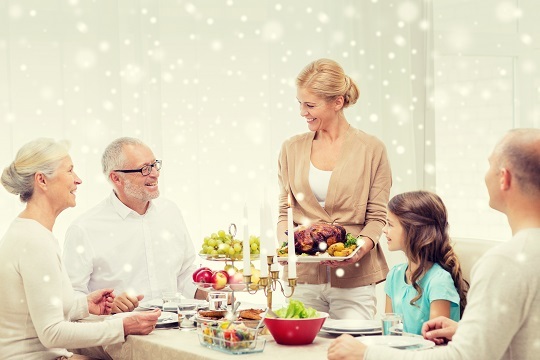 Identification with as much precision as possible the physical and emotional needs of our loved one may be one of the most important and rewarding holiday joys you can experience and share and that will have lasting effect after the holiday trimmings have been stored. All together now: Now what? So we've established that the holidays really are an opportune time to make the first steps in determining the possible needs of your parents for assistance. Now what? The very first step, really, is observing their capabilities yourself and if necessary, having a caregiver assessment done or laying the groundwork for such assessment. As discussed in "Is it time, Mom? Navigating from home to assisted living," many resources are available for assessing the types of help seniors may have the need for, depending upon their current level of independence and functioning. Additionally, AGIS has an entire set of checklists and forms that can help make assistance type and level determinations, including for example a specific assessment of driving skills. Also important on their list of lists is a Personal Information and Records Inventory. Preparing your loved one(s) and you for a future in which assistance will be needed is attended by a remarkable amount of important information in written form that needs to be safely recorded and accessible. It is important to remember, estate planning is not just for the affluent. Christopher J. Berry a Certified Elder Law Attorney of the Elder Care Firm, notes in his piece "Is Estate Planning Only for the Affluent?" that "... there is a level of importance for all estates, regardless of size. If you have a paycheck and some basic possessions, a spouse and/or children, then an estate plan would be a good idea." This article by Christopher Burgess & Kathryn Lyons is adapted and crossposted from the Red Folder blog with permission.